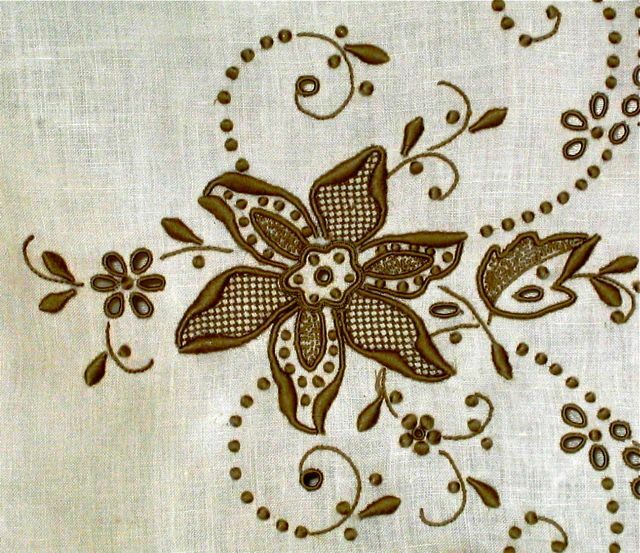 Crafts you can buy in Funchal include hand-painted fans and Portuguese lace. Funchal is the largest city on Portugal’s island of Madeira. It’s on the south—and sunniest—side of the island, full of banana plantations and flowers that bloom year round. 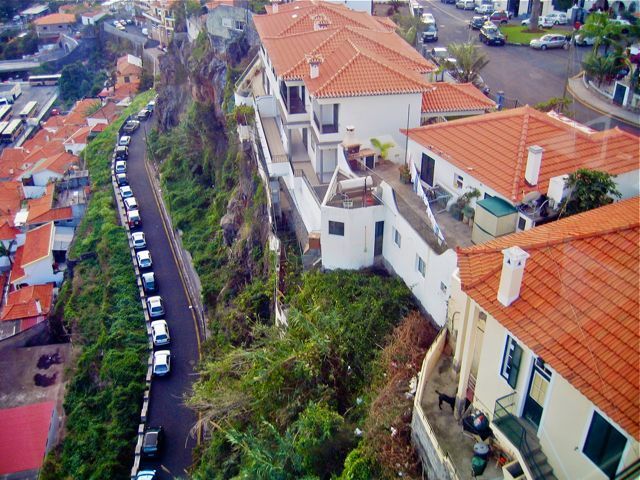 Funchal is a port town nestled in a bowl of hills. We took a tram ride up through the hills—always fun to look down into people’s back yards. Funchal’s main claim to fame is Madeira, a Portuguese fortified wine made here. 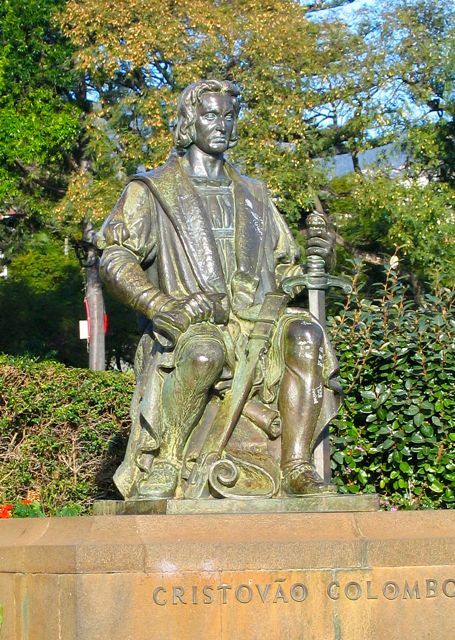 CRISTOVAO COLOMBO, the Portuguese guy who started it all…conning Spain’s Queen Isabel to give him 3 ships so he could prove the world wasn’t flat, find a new, safer and shorter route to those expensive spices in India, and along the way find some gold for Spain. Neutral grape spirits were added so that the wine wouldn’t spoil during the long voyage. But while traveling the wines were exposed to a lot of heat and movement which changed their flavor. So today, during the winemaking process, the wine is heated to high temperatures for an extended period of time and exposed to some levels of oxidation on purpose. This is what makes Madeira a robust wine noted for being long-lived after being opened. So enough about the wine, on to the adventure. 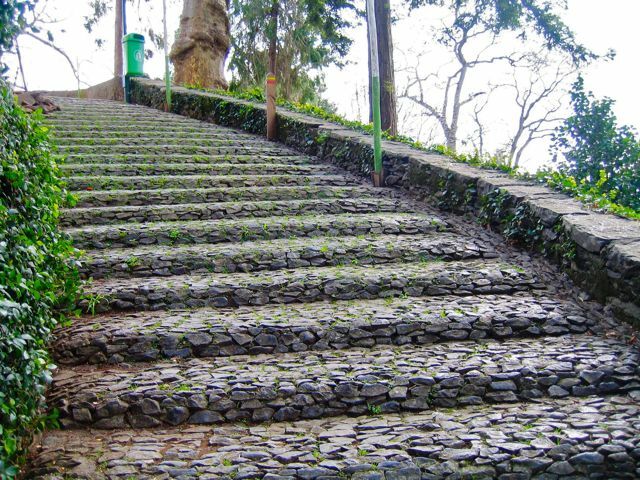 Up and down the hills of Funchal are cobblestone stairs like these. After lunch (with wine) at a very nice Indian restaurant we strolled along a waterfront lined with exceptional restaurants noted for al fresco dining. 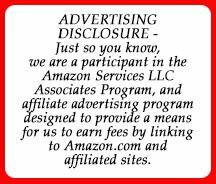 A waiter standing in front of one of them beckoned us inside. “Sorry, we’ve already eaten lunch,” I said. The waiter smiled, gestured with his hands towards the entrance, and said, “Eat again." We decided to do one of the things we love to do in strange towns: get on a bus and see where it goes and what’s at the end of the line, then take it back into town. It’s late afternoon when we board the bus from a cobblestone square in Funchal. As the bus leaves the central area and begins climbing into the hills, a little, withered lady in the seat across the aisle crosses herself. That should have been our first clue. 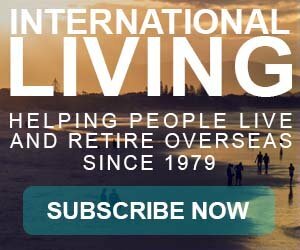 The bus climbs higher and higher, meandering through winding narrow cobbled streets full of charming houses with red tiled roofs. At last we reach the end of the line. The view of the sun setting out on the shimmering ocean is divine. There’s not much happening at the end of the bus line. We are in an obviously residential neighborhood. Now it’s dark. The bus driver speaks no English, and we finally figure out that he’s not driving the bus back into town. He’s done for the day. No other busses are coming, or going. He directs us to the one restaurant with lights on. Inside, the proprietor is happy to call us a taxi. Scenic bus ride up the hills to the end of the line: fifty cents. Taxi ride back down the hills into Funchal: fifty dollars. 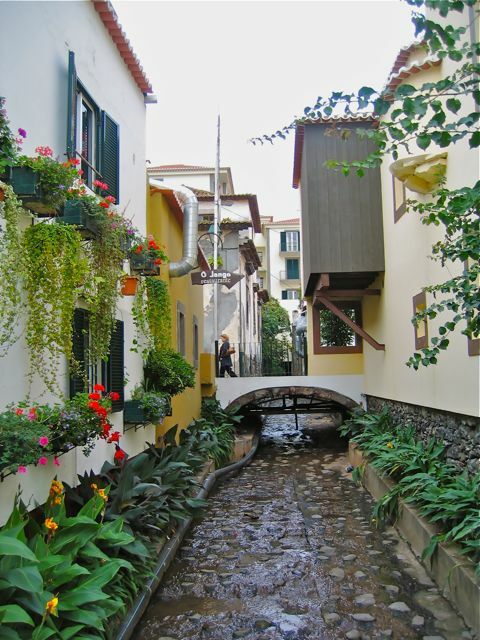 This narrow, colorful street in Funchal crosses a wide stone drainage ditch. 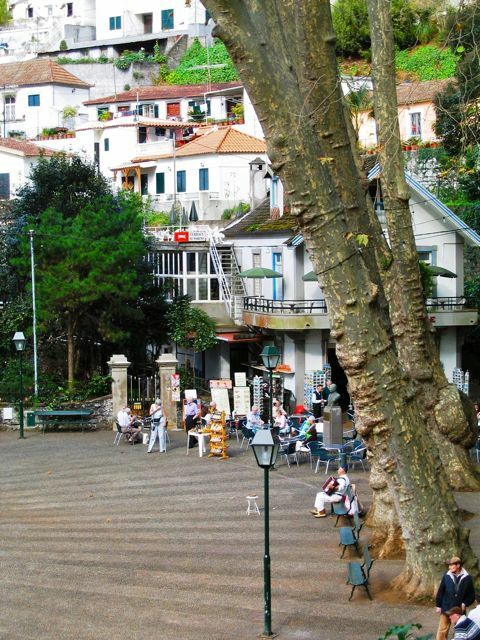 For more than five centuries Funchal has been the island’s capital. Today it is a modern city with a little over 100,000 residents. Points of interest are a big hotel, Reid’s, and—duh—a cathedral. 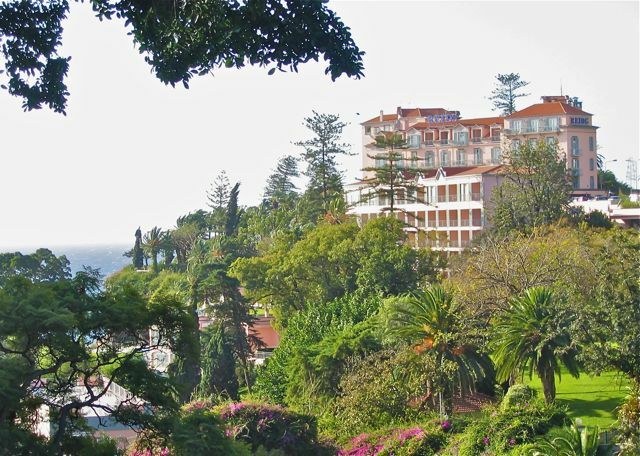 A view of Reid’s Palace Hotel, perched—of course—on a hill, with the sea beyond. It’s a popular European cruise ship port, with cafés, shops and history within walking distance. Visitors come for the year-round appealing weather, fine restaurants, crafts and of course the wine. Naturally, there’s also a wine festival. 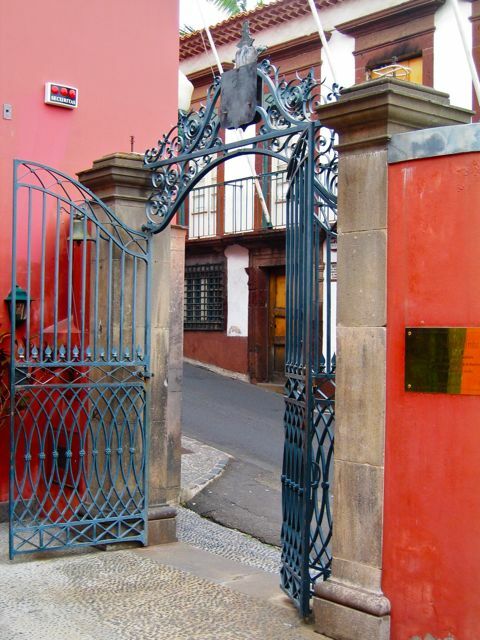 This intricate wrought-iron gate is in front of a museum in an old house. Supposedly Funchal comes alive after midnight, with midnight to 4 a.m. clubs, then 4 a.m. to 7 a.m. clubs. We wouldn’t know; we sleep during those hours. 1. 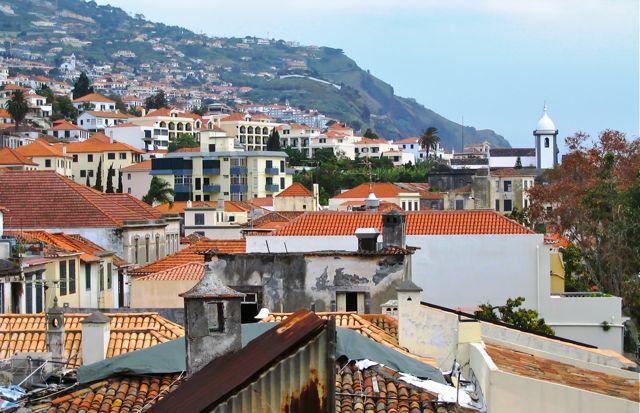 Funchal is one of the cleanest cities in Europe; it is Portugal’s leading city for re-cycling. 2. Because early Portuguese settlers found fennel—funcho in Portuguese—growing in abundance, they named the town Funchal. 3. Forget madeira; today their most famous export is said to be some world class football guy named Cristiano Ronaldo. We enjoyed hanging out in this cobblestone square. 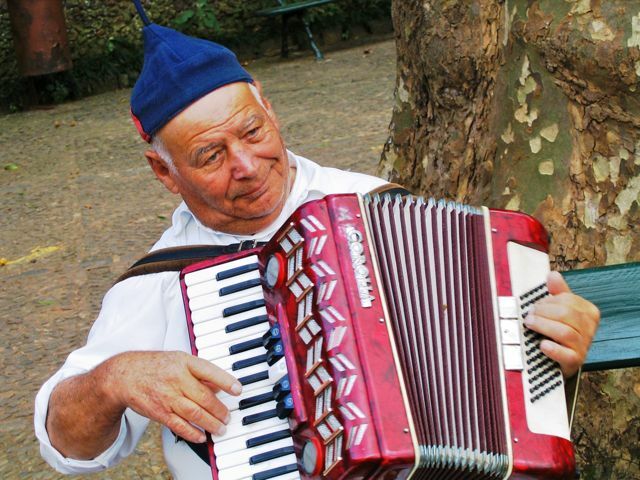 This Portuguese accordion player sat on a bench in the square, entertaining passers-by. He’s going to be featured in my forthcoming e-book, “People of the World” a compilation of 60 photos I’ve taken of people during my travels. Tomorrow’s AtoZ Challenge: For the letter G I’ve chosen Ecuador’s Galapagos Islands.